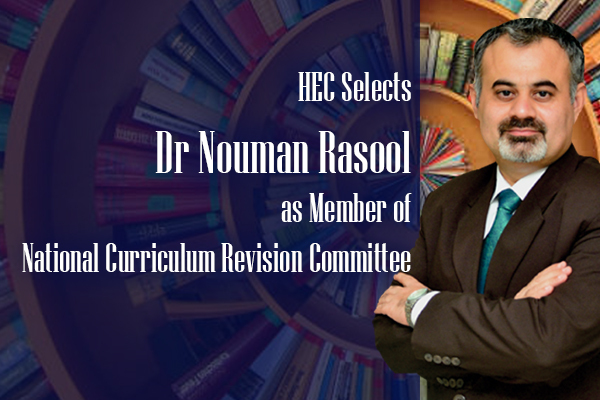 Dr Nouman Rasool, Chairperson, Department of Life Sciences, School of Science, has been selected by the Higher Education Commission, Islamabad, as a member of the National Curriculum Revision Committee (NCRC) in the discipline of Biochemistry for Bachelors and Master Degree Programs. The agenda of the NCRC is to revise the curriculum for BS/MS Biochemistry programs. The revised curriculum would be implemented in all public and private sector universities. It is a great honor for UMT that one of its faculty members has been selected for such a distinctive position.